26th October ’12 – Hired as wedding DJ for Mr & Mrs Fogerty at the Dunkenhalgh Hotel, Clayton Le Moors, Blackburn. I’ve played at the Dunkenhalgh on countless occasions both for weddings & other celebrations. This night we were in the Pendle Suite which is the largest room complete with stage. The stage was filled with a band, as well as booking myself as wedding DJ, they had also hired a Jive band to play 2 sets throughout the evening. 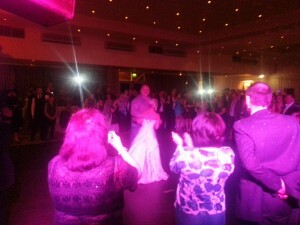 Their first dance was performed to Joe Cocker ‘feels like forever’. 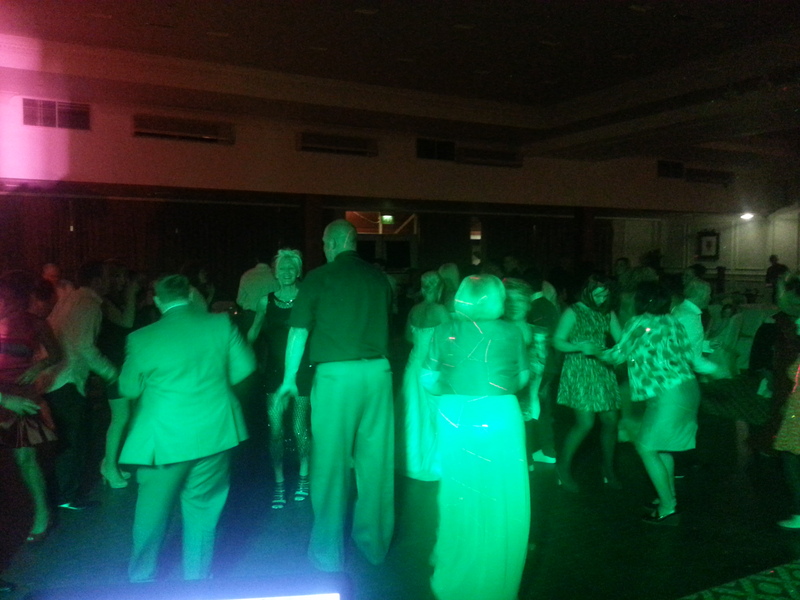 Adam, the groom, had requested mostly 60’s & 70’s party hits rather than the usual current chart favourites which was quite fun for a change, & most of his guests were like minded as the floor quickly filled up. Due to the evening over running somewhat, I think the band’s sets were probably a little too late on in the evening, so they didn’t have quite the strong impact they should have had for their 2nd set, but still entertaining. I finally wrapped up the disco around 1.10am. All the best to Mr & Mrs Fogerty! So, if you’re looking for an experienced wedding DJ for your big day at the Dunkenhalgh hotel, then email your enquiry to andy@andybevents.co.uk As a guide, expect to pay £250 to cover playing times of 7.30pm till 1am. (Or, if you’re having a smaller party, we can cover 7.30pm till midnight for £225). Any additional time is £25 per hour.